It’s hard to believe that the 3rd grading period is almost over. The last day for the 3rd quarter is March 15. This is a great time to check HOME ACCESS to make sure your child is current with all assignments. The 4th grading period starts on March 18. March 9 “BE WELL: A Parent University Event” with Dublin Schools CLICK HERE for more information. Deadline to register is Monday, March 4. As we move further into the school year, we will periodically post information for our seniors and senior parents. THIS DOCUMENT will provide you with information to start planning for that big day in May! 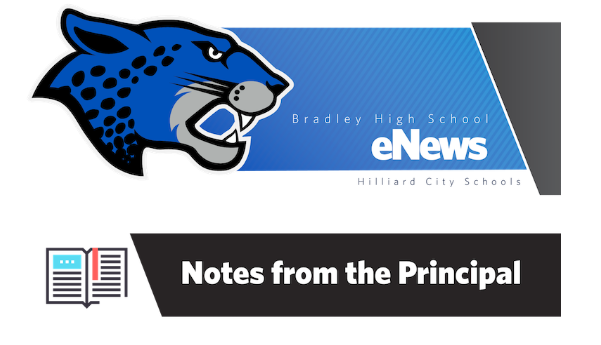 The Hilliard City School District is pleased to announce the first Superintendent’s Listening Tour intentionally scheduled to hear our community’s concerns about specific topics of interest. This tour is designed to hear from our constituents about elementary reconfiguration at Britton/Norwich & Alton Darby/Darby Creek and special education services. You can find the dates and times on our webpage. The school district has used four calamity days this year. While it has been several years since the district has missed school this many days due to inclement weather, it is important to plan ahead in the event of additional winter weather. If we exceed five (5) calamity days, days will be added to the end of the school year. A potential sixth calamity day will be made-up on Monday, June 3, 2019. Days seven through ten will continue the week of June 3-7, 2019. In the event the district exceeds five calamity days, seniors will be required to attend school the week of graduation to make-up educational time. Priority Registration is still open for “Be Well: A Parent University Event by Dublin and Hilliard City Schools” Choose from more than 100 sessions structured around student mental health and well-being. You can register for sessions in either district. This free event will take place at Darby High School and the Dublin Emerald Campus. You can come for one session or stay all day! Lunch will be provided free of charge for those registering with us. Priority registration will close March 4. The event takes place on Friday, March 8 from 7-11 p.m. at the Columbus Vue. To purchase tickets or view sponsorship opportunities please visit the HEF webpage.